"It's a different environment today than the environment we all sat in a year-and-a-half ago," Ballmer told a roomful of business customers at an event in San Francisco. Microsoft had no idea at that time that it would be launching three major products -- Windows 7, Windows Server 2008 R2 and Exchange Server 2010 -- into such an uncertain economic climate. "I can't tell you that this was the economy we thought we were going to live in," Ballmer said. Overall, the CEO's comments betrayed a few chinks in the usual armor of confidence that cloaks Microsoft executives when discussing their projections for next month's global release of Windows 7. Ballmer took a poll of the people in the room to find out if IT budgets at companies were up, down or frozen. While a scant few said they were up, most said they were down or frozen, a trend Ballmer said he knows will make it difficult to convince people to purchase new software. Calling the current IT climate a time for "new efficiency," Ballmer said companies are looking to do more with less and will likely free up IT budgets only to purchase products that allow workers to collaborate more efficiently and take costs out of business. He tried to position the three upcoming products, but Windows 7 in particular, in this light, saying they would help customers achieve innovation and cost savings in their businesses. Ballmer cited customer case studies the company prepared with analyst firm Gartner, intended to show how the new OS can help businesses save money in three key areas. The studies were first released a couple of weeks ago in an earlier promotional push for Windows 7. According to the report, companies achieved annual costs savings of $US36 to $US45 per PC on the service desk; $US25 to $US98 per PC for desktop management; and $US28 to $US61 per PC in deployment and provisioning. 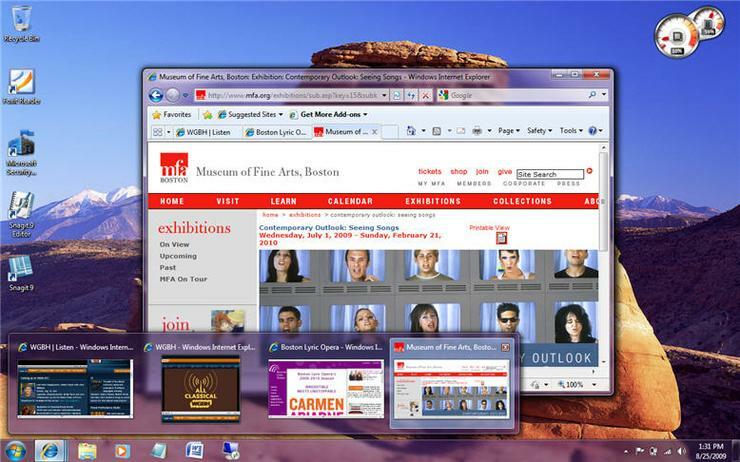 Microsoft promoted Windows 7's predecessor, Vista, with similar case studies. But many businesses ultimately shied away from Vista because they considered it sub-par, and much of Microsoft's marketing efforts around Windows 7 have been focused on repairing that damage. "Vista was a nightmare," said Brent Allard, a studio technical support manager for Electronic Arts, who was at Microsoft's customer event Tuesday. But EA has been using Windows 7 for some time as an early adopter, and Allard said Microsoft seems to have put right the flaws in Vista and developed an OS that is relatively bug-free, efficient and useful to EA's business. Ballmer acknowledged that many businesses are long-overdue for a PC and OS refresh, because many are still using Windows XP or even Windows 2000. Still, the improvements in Windows 7 and the need to upgrade soon are no guarantee that businesses will free up their budgets for Windows 7, and Ballmer seemed mindful of this. But he said the triptych of products Microsoft highlighted at the event are the company's best effort to help customers do more with less, and that strategic investments in software will ultimately help businesses save money. "Now is one of the most challenging times ever in the IT business," Ballmer said. "These are three products that are really super-well-suited to the new efficiency. Now we really get to show our stuff."